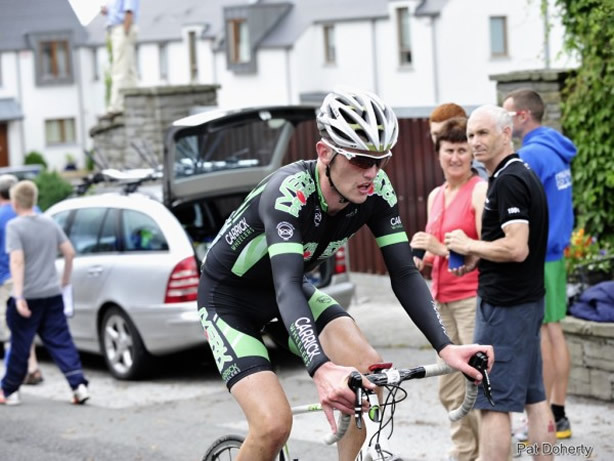 Iverk Produce Carrick Wheelers duo of Sean Hahessy and Conor Hennebry continued there good run of form last weekend when both riders rode to victory in their respective categories at the Munster Cycling Championships. Hahessy rode a brilliant race, winning the junior catgory, while Hennebry similarly performed superbly, to take the victory in the 3rd Category section. The event itself was held in the small town of Whitchurch, which is located just outside Cork city and the race was a total of 103km over six-laps of a circuit. During what was an aggressive race, Hahessy eventually found himself amongst the lead group of seven riders, midway through the contest, with this group working well together to open up a minute or so advantage on the rest of the peleton. As the race progressed, this lead group spilt again, with the senior riders of Paudi O’Biren and Mike Storan setting off for the finish line and the junior riders of Carrick Wheelers’ Hahessy and Limerick’s Stepehen Shanahan next on the road, with the remaining three cyclists of the original seven-man break-away being swallowed up by the main field. Amazingly, even though Hahessy and Shanahan are both junior (U18) riders, they would be fighting it out for 3rd place in the senior race but more importantly the gold medal and title of Munster Junior National Cycling Champion. As the former An Post professional O’Brien, duly went onto take the victory, with his breakaway compatriot Storan taking silver, the more intriguing battle for third place and junior gold was heating up behind. When the junior duo closed in on the chequered flag, it was clear that Carrick Wheelers rider Hahessy was too strong for his rival as he crossed the line in 3rd place overall taking the prize of first junior. Having achieved such a result in the Munster Championships, Hahessy will be full of confidence going into his next big event the Suir Valley 3 Day which takes place this August Bank Holiday Weekend. Meanwhile, back in the peleton, Hahessy’s teammate Hennebry was riding a clever race. Knowing his teammate was ‘up the road’, he wisely choose to not involve himself in any chasing and made a plan to conserve as much of his energy as possible for the finishing sprint. Hennebry’s plan worked to perfection as, in what was a difficult uphill sprint; he strongly galloped to the line to take the 3rd Category Senior gold medal, making it another very successful day for Iverk Prodcue Carrick Wheelers.